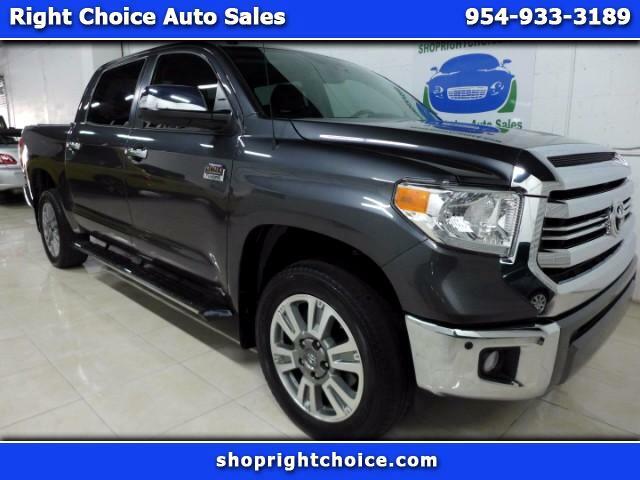 WE CAN DELIVER THIS TOYOTA TUNDRA TO ANY DRIVEWAY IN THE COUNTRY! VISIT OUR WEBSITE AT WWW.SHOPRIGHTCHOICE.COM TO SEE 90 PHOTOS, THE FREE CARFAX, AND MORE INFO ON THIS AWESOME TRUCK! THIS 1-OWNER, CLEAN CARFAX, 1794 EDITION CREWMAX TUNDRA HAS EVERYTHING YOU WANT AND IS PRICED TO BE THE BEST DEAL IN THE COUNTRY! IT HAS 22 MONTHS OF FULL BUMPER TO BUMPER FACTORY WARRANTY AND IS PRACTICALLY NEW, EXCEPT FOR THE PRICE! THE KELLEY BLUE BOOK VALUE IS $44,665 AND THE CARFAX VALUE IS $46,500! DON'T MISS THIS DEAL.